No cup holder on your scooter? That’s unfortunate. Here’s a re-usable double walled ceramic cup with silicone lid. It’s both dishwasher and microwave safe and holds 12 fl oz. Made by Decor Craft Inc. and can be ordered here for $14.50. The substitute for a cold winter’s ride. Have a cuppa in your 3-D Vespa mug instead. 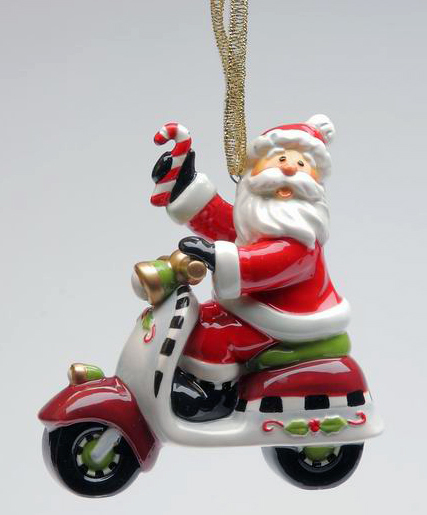 This 3-D handle design comes in red or blue Vespa. These are handmade and cost Â£29.95 each. They measure approximately 10 cm X 8 cm. Thanks to Cassie for this great find! Spotted on eBay! I have been unable to find out much about this adorable little guy â€” gleefully bearing a candy cane. I do know this: I want one. And that means we here at ScooterSwag will be keeping our eyes peeled. You’ll be the first to know if I find a source. 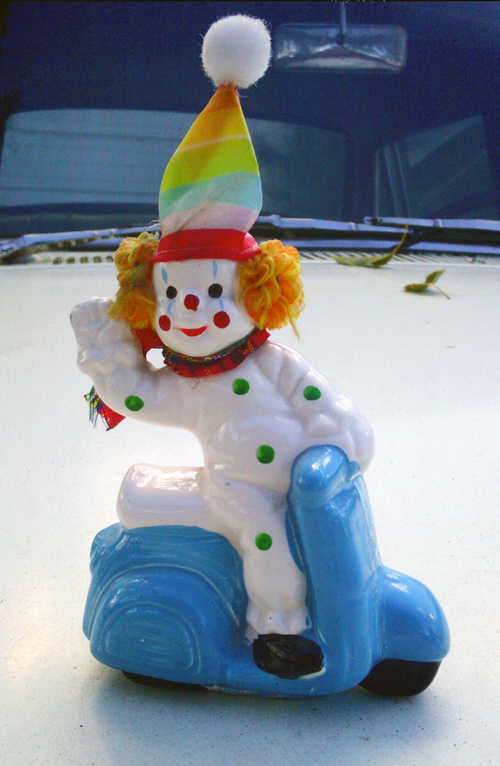 Super collectible scooter clown. Only $300! Plasticland always has the cutest things. In fact, I call them “deadly” because visiting their site is a dangerous proposition for someone trying to save their money for “important” things like say, paying off school loans or saving for retirement. 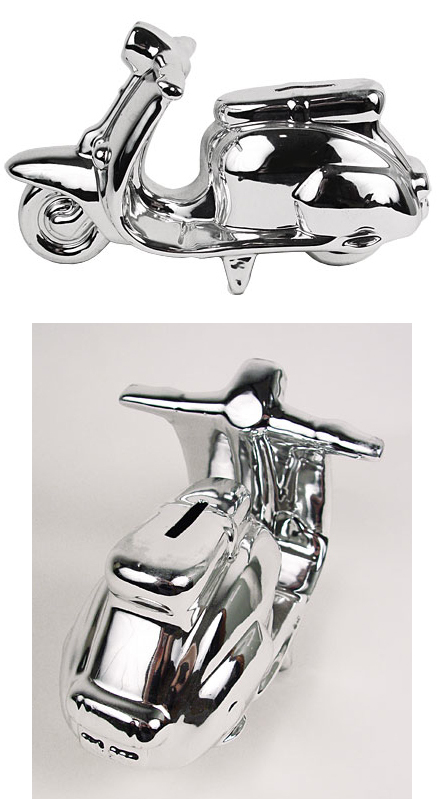 Still, this chrome and ceramic scooter IS a bank which should help you save some money. (Even if it’s for a Series 3 and not a 401K.) Measures 8.5″d x 4.5″t x 4″w and costs $24. If they run out, don’t worry. They restock pretty regularly and you can add it to your “wish list” at their online store.